Call 515-957-1121 to schedule your first appointment. Your ability to hear can greatly impact your overall quality of life. Whether you’re encountering a hearing problem for the first time or have been seeing a hearing specialist for years, if you feel that your hearing isn’t what it should be, come to Miracle-Ear. As an established hearing centre in Des Moines, IA, our goal is to help you reach the point where hearing isn’t something you have to think about, but rather, it’s something you simply do naturally. For more information about our Des Moines, IA hearing centre or to see how we can help you, call or visit Miracle-Ear today. Robin has worked as a Hearing Instrument Specialist since November 2013. Robin is Board Certified and has an Iowa State license form the board of Hearing Aid Dispensers. 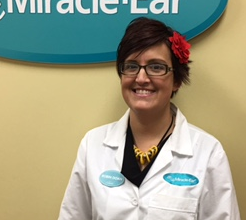 Robin is Miracle-Ear LMS certified, a member of International Hearing Society, and Iowa Hearing Association. 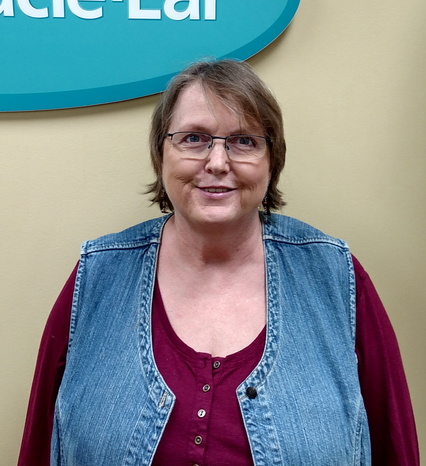 Robin's favorite part of working at Miracle-Ear is being part of the patience experience, when they hear things they haven't heard in a long time, for the first time. My prior career experience working in a major insurance company - with and for attorneys in commercial real estate helped me to understand how delicate relationships are as they evolve and how to work with a multiple client base. Every year I am recertified as a Front Office Associate. Being able to see the client's eyes shine when they hear things they have not heard in a long time. One gentleman we worked with had not heard his wife's voice for 15 years. Tears rolled down his face.